The Aquarius-identities should be ready for tough times that are nearing. While the year 2017 would last, there will take place multiple changes and there may appear serious contests. At times, you will be bored. However, there will come the periods of a real excitement. Under the condition, you make good friends with your collaborators your routine fulfillment of duties at work will be less boring. Use your vacations and all weekends to have a pure fun in all possible ways. This will put off some tension. Identities born under this water sign are commonly very devoted and funny companions. The friendship with such personalities runs in a weird way. Nevertheless, it attracts others. They are intelligent and know so many things. They are great innovators. Their ideas may interest anyone. They are enchanting and kind-hearted. If you desire to experience something novel, you should hand out with them. They always reach out for some novelties. All routine will simply disappear. In most occasions, you can rely on these identities. Nonetheless, they tend to fail their friends in really important things. They are so multi-sided that sometimes get lost in their own problems. The upcoming year may be successful for them if they play the right card. 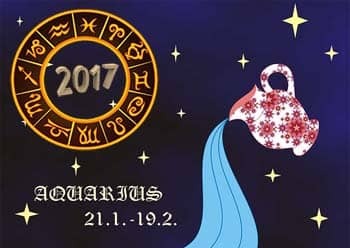 There is a prediction that all Aquarius-identities will feel deeper and stronger feelings to some of their friends. This is a common thing for the people of this sign. They seek their second parts amongst the trusted friends. They wish to deal with people whom they know and whom they trust. Therefore, give more heed to the closest friends of yours while this year would go on. You may go for dates to receive some fun and all of a sudden, you will understand that the time has come to move on to another stage. You will be seeking those folks who have the same ideas and beliefs as you do. You need a closely related soul. You will give more heed to your family affairs as well. Your family members will be of great importance for you and may probably affect your life. In what way? It is not known. However, you will know how to answer this question. Remain among other people and improve your social ties. In the previous year, most of Aquarius-identities tended to sacrifice their careers for personal development. You paid more attention to your weird life preferences. Nevertheless, in 2017 you should be devoted to your work. It is necessary to compile some money to bring to life your ideas and projects. Therefore, you should work hard to gain what you need. Be serious and determined. You can freely share your ideas with other co-workers to enjoy better and quicker success. Thanks to your great creativity and resourcefulness at work, you will earn a lot of money. You should be focused on the main tasks. Avoid visiting stores. There is a strong tendency to become very wasteful. Save your earnings and you will reach a tremendous financial stability. Probably, you will have to make some sacrifices this year. You cannot afford everything. While this year would last, you may be severely lacking energy. You could be eager to visit gym and exercise. However, you will hardly reach a lot. Your energy stores will quickly get exhausted. Consequently, you should not be too pushy. Try to relax and always have a prolonged rest at the end of the week. Do not undertake too many things. Follow a healthy diet. All the products you consume should contain all necessary elements and your organism with great amounts of energy. Probably, a vegetarian lifestyle will suit you for some time. avoid bad habits and all products, which may lead you to obesity. If being in shape, you will avoid any health complications.